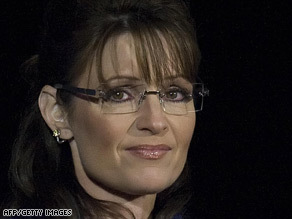 (CNN) - Sarah Palin told local reporters in Alaska that unhappiness with the Bush administration’s Iraq war policy and spending record were responsible for the GOP ticket’s defeat this year. 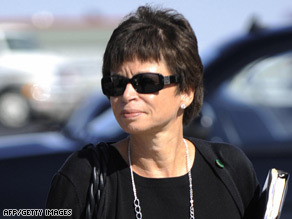 Valerie Jarrett is one of Barack Obama's closest advisers. (CNN) - Two Democratic sources close to President-elect Barack Obama tell CNN that top adviser Valerie Jarrett will not be appointed to replace him in the U.S. Senate. "While he (Obama) thinks she would be a good senator, he wants her in the White House," one top Obama advisor told CNN Monday. Over the weekend, Democratic sources had told CNN as well as Chicago television station WLS-TV that Jarrett was Obama's choice to fill his Senate seat. Jarrett, a Chicago attorney and one of Obama’s closest advisers, is a leader of the president-elect’s transition team. MINNEAPOLIS, Minnesota (CNN) - For the second time in a week, Republican incumbent Sen. Norm Coleman's camp is labeling him the winner in Minnesota's far-from-over Senate race. Coleman leads Democratic challenger Al Franken by just 206 votes as the first round of tallying comes to a close Monday evening. "Sen. Coleman remains the winner in this election despite unexplained discrepancies in reporting ...that have virtually all benefited the Franken campaign," Coleman spokesman Tom Erickson said in a statement. That result means little at this point: Minnesota law mandates a recount when the margin of victory in a race is less than .5 percent. 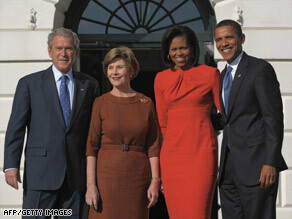 President Bush and Laura Bush welcome Barack and Michelle Obama to the White House on Monday. (CNN) - President Bush and first lady Laura Bush welcomed President-elect Barack Obama and his wife, Michelle Obama, to the White House on Monday afternoon. 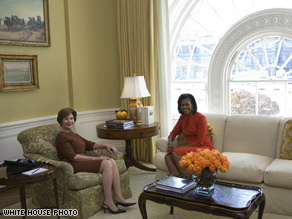 Bush and Obama held a private meeting in the Oval Office, while the first lady gave the incoming first lady a tour of the residence. The president and president-elect walked together along the colonnade by the Rose Garden before entering the Oval Office together. They briefly waved to reporters along the way. 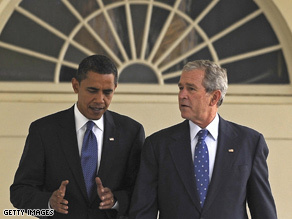 Obama and Bush were not expected to speak on camera following their meeting. An aide to Obama said they were "going to let the pictures speak for themselves." The two met in the Oval Office for just over an hour. When President George H.W. Bush hosted President-elect Bill Clinton after the 1992 election, the two talked for nearly two hours. Monday's meeting was a historic formality, but it was also a time for serious talks. It marked the first time that Obama has visited the Oval Office. WASHINGTON (CNN) - A federal judge in Washington Monday allowed two private watchdog groups to sue the White House in a case involving potentially millions of missing e-mails. U.S. District Judge Henry Kennedy rejected a Bush administration request to throw out a suit by Citizens for Responsibility and Ethics in Washington (CREW) and the National Security Archive. The government had argued the courts do not have the authority to require the White House to try to retrieve the e-mails in question. CREW and the National Security Archive are trying to force White House officials to order the attorney general to initiate action to restore the deleted e-mails before they become irrecoverable. The current and future First Lady met Monday. Photo credit: White House photo by Joyce N. Boghosian. "The President and the President-elect had a long meeting, described by the President as good, constructive, relaxed and friendly. They spoke about both domestic and international issues, though since it was a private meeting the White House will decline to comment on specifics. The President also showed President-elect Obama the living quarters, including the office the President uses, the Lincoln Bedroom, and the rooms for the Obamas’ two young daughters. The President enjoyed his visit with the President-elect, and he again pledged a smooth transition to the next administration." “President-elect Barack Obama and Mrs. Michelle Obama were very warmly welcomed today at the White House by President George Bush and First Lady Laura Bush. 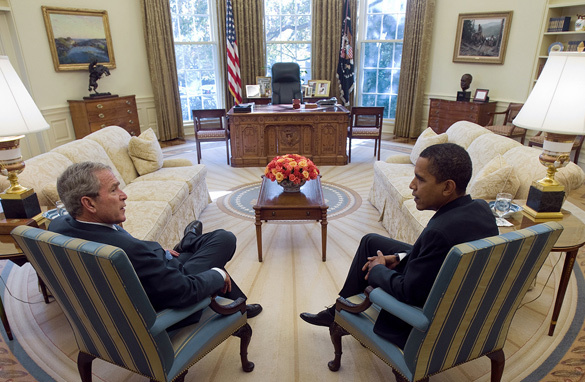 Upon arriving, President-elect Obama and President Bush proceeded to the Oval Office, where they had a productive and friendly meeting that lasted for over an hour. They had a broad discussion about the importance of working together throughout the transition of government in light of the nation’s many critical economic and security challenges. President-elect Obama thanked President Bush for his commitment to a smooth transition, and for his and First Lady Laura Bush’s gracious hospitality in welcoming the Obama’s to the White House." Obama and Bush met at the White house Monday. WASHINGTON (CNN) - As President-elect Obama visits the White House, a new national poll illustrates the daunting challenges he faces next year. 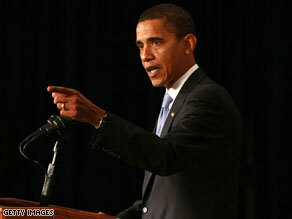 "The challenge Obama faces has never been greater. No president has ever come to office during a time when the public's mood has been this low. In the 34 years that this question has been asked, the number who say things are going well has never fallen below 20 percent," said CNN Polling Director Keating Holland. The 83 percent saying things are going badly is "more than in 1992, when the first President Bush was ousted because of the economy, stupid. That's more than in 1980, when President Carter got fired after the malaise crisis. That's more than in 1975, after Watergate and the Nixon pardon," says CNN Senior Political Analyst Bill Schneider. So far, Obama seems to be meeting the public's high expectations. Two-thirds of all Americans have a positive view of what Barack Obama has done since he was elected president and three-quarters think that Obama will do a good job as president. Cafferty: Meaning of Obama’s plan for executive orders? Barack Obama won the White House last week on a message of “change.” That’s something that’s easier said than done in Washington. But the president-elect’s transition chief John Podesta told “Fox News Sunday” that Obama plans to use his executive powers to make an immediate impact when he takes office in January. Terry McAuliffe has been laying the groundwork for a gubernatorial run. (CNN) - Hillary Clinton’s former campaign chairman filed papers Monday forming an exploratory committee to run for Virginia governor. 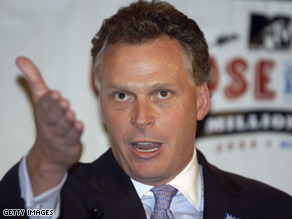 Terry McAuliffe was widely expected to make his decision after Election Day. The former Democratic National Committee chairman will now do a 60 day listening tour of the state. In September, McAuliffe hired longtime Virginia political consultant Mo Elleithee to start planning a possible statewide campaign, should he decide to run. Elleithee spent the last year working alongside McAuliffe in the Clinton campaign as a senior spokesman, but in recent years he has also helped steer Tim Kaine and Mark Warner to signature Democratic victories in Virginia. Should he run, McAuliffe will face off in next year’s Democratic primary against state Sen. Creigh Deeds and State House Rep. Brian Moran. Virginia’s Attorney General Bob McDonnell is expected to run for the Republican nomination unopposed.